Floor matting is an under-appreciated part of maintaining a clean and safe facility. Different mats have different purposes, but one primary role is to keep dirt and water contained from the minute someone walks through the front door of the building. The right mats can reduce cleaning time, improve the appearance of your facility, and reduce the risk of slip and fall injuries. The International Sanitary Supply Association (ISSA) has found that as much as 80% of the dirt that enters a facility is tracked in as people enter the premises. Not only is this dirt, mud, and water unsightly, it can increase the risk for slip and fall injuries. When dirt and contaminants are allowed to enter a facility, it can cost up to $600 per pound to remove them. 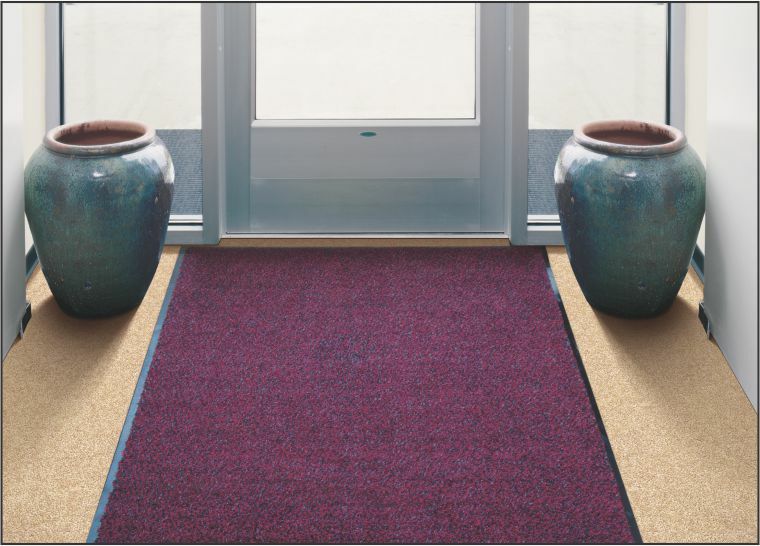 High performance entrance mats and entrance systems can capture as much as 90% of these contaminants at the door. This proactive measure greatly reduces occupant exposure while saving your facility hundreds of dollars annually in cleaning and maintenance costs. Interior mats have many useful functions. They can help control dust and they minimize wear and tear on floors. In high traffic areas, they can also protect the floor from spills and contamination. “Finishing” mats improve traction on hard surfaces and custom logo mats can improve the welcoming appearance of your facility. Slip resistant mats can minimize slips and falls in high risk and high traffic areas. Choosing the proper backing is essential for preventing slips, trips, and falls. M+A Matting’s “Anchor Safe” rubber backing keeps mats in place on virtually all hard surfaces, even with high cart and pedestrian traffic. This patent pending design is certified by the National Floor Safety Institute (NFSI) and is available on most versions of Waterhog mats. NFSI certified mats undergo a rigorous series of tests that include real world applications. Commercial employees that stand on hard surfaces often suffer from fatigue and discomfort that can lead to reduced productivity. Prolonged standing can also lead to chronic pain and injuries. With anti-fatigue matting, employers can see benefits such as increases in productivity and worker morale, and decreases in sick leave and workers compensation claims. Entrance mats are an integral part of any green cleaning program. They improve efficiency by preventing contaminants from entering a facility. This substantially reduces the need for cleaning chemicals and floor cleaning labor. Mats make buildings greener by keeping them cleaner. M+A Matting is also a member of the U.S. Green Building Council. They are committed to developing and manufacturing eco-friendly mat products. Their high quality mat line includes over 50 mats with recycled content. Different floor mats have different purposes. They can stop dirt and spills, improve the appearance of a facility, improve air quality, and more. The right mats in the right locations will do more than protect your floors. They will protect your employees, your customers, and your wallet. Talk to your Maintex representative about your floor mat needs today. Photos and facts provided by Maintex partner M&A Matting.